Last month, I submitted a story of a car or truck tire attached to a green plastic container which was placed alongside the coastal highway/MX 003 to alert approaching motorists of the presence of a dangerous pothole (see Rocky Point Times, June issue). While I’m almost certain the contraption was not a Mexican Department of Transportation/MDOT approved traffic barricade, it was all there was. No orange cones, reflective triangles or flashing safety lights were present. Just an old worn tire in a box. A similar situation exists on MX Highway 8, several miles south of Sonoyta. 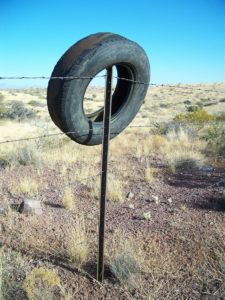 Some concerned citizen placed a discarded tire atop a steel fence post to indicate an eroded portion of the highway’s shoulder. While the pavement wasn’t affected, the presence of numerous rocks and rivulets washed down from the side of the adjacent incline was, apparently, reason enough to inspire the installation of an impromptu safety marker. Assuming that’s what it is there for. Or, maybe someone thought it would make an attractive roadside decoration. Of course, there is always the possibility the tire fell off a passing vehicle and a good Samaritan stopped to remove it from the roadway. Whatever the case, a tire on a post is yet another illustration of the unusual assortment of things to see while traveling in the Land of Mañana.